The new generation of IndraDrive Mi drives can adapt to individual conditions like almost no other decentralized drive system. Modern production lines are often made up of standardized basic modules, which are combined and modified according to the customer‘s requirements. This type of modular philosophy requires electric drive technology that can be integrated flexibly in any decentralized machine concept and keeps the installation effort low for extensions and conversions. With a pioneering status in modular, ultra-compact drive technology, IndraDrive Mi has for years now been working effectively in a wide range of applications that rely on maximum flexibility with minimum space requirements. End users gaining valuable space for additionally machines on their available footprint. In mechanical engineering, the design process traditionally begins with the mechanical design. After this, a strict sequence is followed: The mechanical engineers pass the design to the electrical engineers, who dimension the drives and motors. Afterwards, the control unit is programmed. Only during testing does it become clear whether the routines work or not. In the worst case, you hear a bang because a step was overlooked or the kinematics are not right. Rectifying defects on the real machine is risky, expensive and jeopardizes the success of the project. Are there any alternatives? The US packaging manufacturer WestRock, with the assistance of Bosch Rexroth, has managed to minimize test risks and drastically reduce the time-to-market using simultaneous workflows. Winkler + Dünnebier in Neuwied, Germany, is one of the most renowned manufacturers of machines for the production of paper tissues: On dual lanes, the FLOWTOS system can produce up to 4,600 tissues per minute and also manages their hygienic packaging. The modular design, which takes advantage of Rexroth’s cabinet-free IndraDrive Mi servo drives, helps W+D to save time, space and costs. 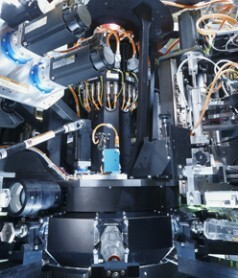 With the cabinet-free TLM machine, Schubert paves the way for a new era in packaging technology. Eliminating the control cabinet increases availability and lowers life-cycle costs. Efficiency reaches new records. 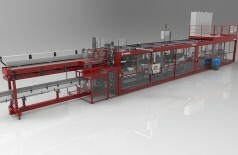 See the first cabinet-free TLM packaging machine in our video - here it is packaging infusion bags. The machine is also equipped with our new 3D scanner. This technology increases quality control to a new level of performance. The 3D scanner develops attractive control parameters, e.g. volume, weight, and stacking height. In CAMA's newest high-end loading unit, 12 robots work together in a very small space. To accomplish this, the near motor drives are directly installed on the machine and are thus located outside of the hygienically sensitive area. IndraDrive Mi drives are supported by the patented CAMA anti-collision software to ensure the necessary, highly dynamic movements. The result: an extremely clever co-flow loading unit. A new screen printing line built by KBA Kammann minimizes the time needed to change out the inking unit and thus saves money. Hamburger Schiffbau-Versuchsanstalt HSVA uses cabinet-free IndraDrive Mi drives to precisely simulate sea swells. With unrivaled simplicity, the individual sections of the wave generator can be flexibly added and removed. Without the common tangle of cables, and it can be expanded at any time with modules. For waves that are precise and reproducible, created highly dynamically and with extreme accuracy. The cabinet-free drive technology IndraDrive Mi allows Winkler+Dünnebier maximum machine modularity and engineering efficiency. The cabling requirements and cable lengths are reduced by up to 90%, the spatial requirement for the control cabinet is drastically reduced and the cooling required for it becomes superfluous - at least in part. The new high-performance end packaging machine EF2 by Rovema uses cabinet-free drives by Rexroth for the first time in order to optimize the footprint and cable routing. The company VC999 has been producing vacuum packaging systems for more than 40 years and stands for maximum performance and quality. 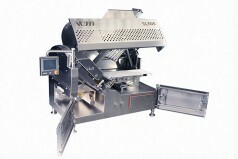 High-performance slicers complete the program with the newly developed SL600. In a completely new design, this machine sets new standards in terms of performance, precision, and user-friendliness - based on the automation system IndraMotion and engineering support from Bosch Rexroth.